The postsynaptic signal transduction mechanisms for agrin have also been examined (Figure 1.3). Muscle specific kinase (MuSK) is a receptor tyrosine kinase that is essential for agrin signal transduction16. Mice that lack MuSK show a phenotype similar to agrin-knockout mice, with a complete lack of AChR clustering (even more severe than the agrin-knockout phenotype) and a similar presynaptic phenotype17. In addition, muscle fibers cultured from MuSK-knockout mice do not respond to agrin, and agrin is capable of activating MuSK in a variety of heterologous in vitro systems. However, direct binding of agrin and MuSK has never been achieved, leading to the hypothesized existence of an accessory factor termed MASC16. synapses. Targeted elimination of the rapsyn gene in mice also results in a complete failure of AChR clustering, although the receptors still appear to be more concentrated, albeit diffusely, in the central portion of the muscle and the extent of the presynaptic overgrowth is less severe in rapsyn knockouts than in agrin and MuSK knockouts20. Figure 1.3. Agrin at the Neuromuscular Junction. 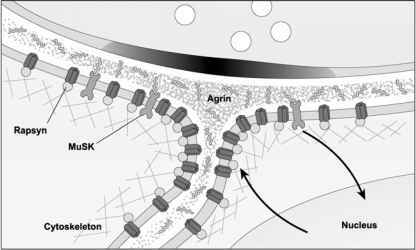 Agrin is an extracellular matrix molecule that is essential for neuromuscular junction development. Agrin is made by both the motor neuron and the muscle fiber, but due to cell-type-specific alternative splicing, different protein isoforms are produced. Only those isoforms made by neurons are active in NMJ development. 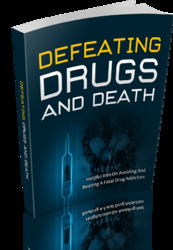 Agrin's signal is transduced by a receptor tyrosine kinase, Muscle Specific Kinase (MuSK). MuSK is also essential for postsynaptic differentiation. MuSK signaling influences postsynaptic gene expression and the protein has direct physical roles in the aggregation of AChRs. 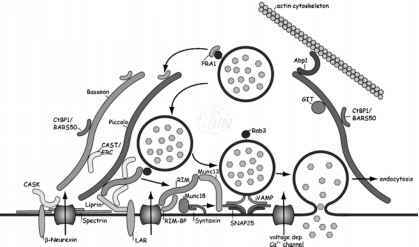 Rapsyn is an intracellular effector of agrin/MuSK signaling. It scaffolds AChRs and other postsynaptic proteins into clusters at the synapse and links these to the actin cytoskeleton. The loss of any of these proteins results in a failure of NMJ formation. The rapsyn-knockout mice also illustrate that there is more to postsynaptic differentiation than AChR clustering. In particular, the myonuclei that fall directly below the nerve terminal (synaptic nuclei) have a different pattern of gene expression than nuclei in the rest of the syncytial muscle fiber (extrasynaptic nuclei). The synaptic nuclei are located near the plasma membrane and are closely associated with other components of the postsynaptic apparatus. In rapsyn-knockout mice, the pattern of synaptic gene expression for transcripts such as AChR subunits is not as severely disrupted as it is in agrin or MuSK knockouts21. These results suggest that agrin signaling through MuSK has an effect on postsynaptic gene expression as well as receptor clustering, while rapsyn is a more downstream effector, more important for the physical aggregation of the receptors than for signal transduction. and necessary for its signal amplification. Furthermore, transcription factors such as the Ets-domain protein, GABP, are important for postsynaptic gene expression and the promoter sequences of several synapse-specific genes such as utrophin, AChE, and subunits of the AChR, contain a six-base-pair upstream regulatory element, the N-box sequence24,25. This transcriptional mechanism is stimulated by both agrin and neuregulin signaling and relies on MAPK- and JNK-signaling pathways. Synapse-specific gene expression in synaptic nuclei of muscle fibers may be analogous to synapse-specific translation of dendritically localized mRNAs in the CNS, providing a mechanism for local synthesis of proteins important for the formation, maintenance and plasticity of the synapse. Therefore, agrin may still represent the best example of a synaptogenic molecule to date. In vitro, purified or recombinant agrin is capable of inducing sites of postsynaptic differentiation on cultured muscle fibers. In vivo, expression of Z+ forms of agrin in muscle causes AChR aggregation independent of nerves 26,27. Furthermore, the disruption of the agrin gene results in a loss of postsynaptic differentiation in muscle10,12,13. However, recent results suggest that it is too simplistic to conclude that agrin induces postsynaptic differentiation.